MOSCOW, July 19. /TASS/. 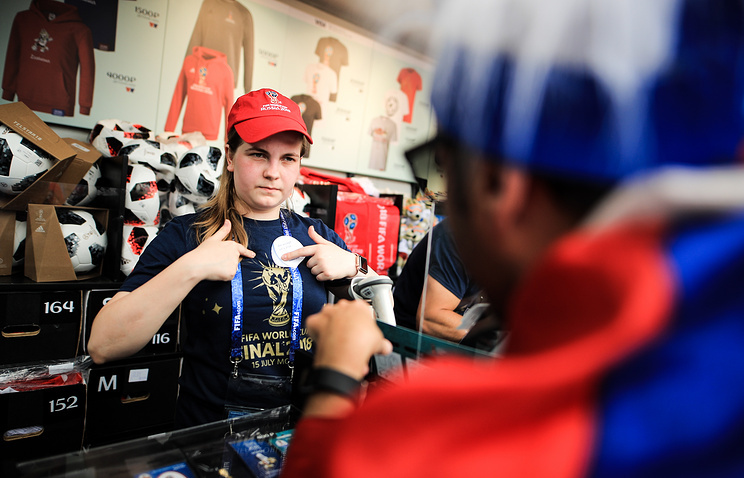 The 2018 FIFA World Cup has become one of positive factors driving the growth of retail trade in Russia to 3% in annual terms in June 2018 following a 2.4% rise in May, Russia’s Economic Development Ministry said Thursday. "Retail trade growth accelerated to 3% in June year-on-year from 2.4% year-on-year in the previous month, which was connected with higher consumer demand and an extra positive effect of the FIFA World Cup," the ministry said. Meanwhile, GDP growth slowed down to 1.1% in annual terms in June, versus 2.2% in May and April. The construction and agriculture sectors also showed poorer results in June, and industrial production growth slowed down to 2.2% versus 3.7% in May. Russia’s Economic Development Minister Maksim Oreshkin said earlier that the 2018 FIFA World Cup would have a minor effect on the country’s macroeconomic indicators, though the regional effect might turn out to be more prominent. He added that the infrastructure constructed for the tournament might trigger further development in Russia’s regions. Moody's rating agency said earlier that Russia would experience a short-lived economic benefit from hosting the 2018 FIFA World Cup tournament. Russia selected 11 host cities to be the venues for the matches of the 2018 World Cup that was held in the country in the period between June 14 and July 15. According to preliminary data provided by the Federal Agency for Tourism, 2.9 mln foreign fans visited Russia during the 2018 World Cup.